"The Kooikerhondje is a breed who's origin is dutch, and originally bread to lure ducks into a ditch leading away from the pond. With proper direction this dog breed made great hunters". The Kooikerhondje or Kooiker Hound, is a small spaniel-type breed of dog that was originally used as a working dog, particularly in duck hunting and tolling. The breed is rapidly gaining popularity in the United States and Canada. You will find that the Kooikerhondje was around late in the 16th and the early 17th centuries, and have appeared in the paintings of well know artist such as Rembrandt and Steen. The dog was even said to be the primary reason why Prince William II of Orange lived: If it wasn't for this dog he would not have been awakened and may have been the victim of an assassin. 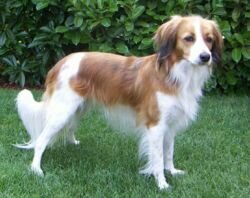 During World War II there was a screeching halt to the reproduction of the Kooikerhondje. The decrease almost eliminated the entire breed. However a Baroness with an affinity for the dogs had traveling salesmen on the search for the dogs and she bred them with Tommy a female dog. Kooikers are intelligent, alert, active, agile dogs, generally with a benevolent nature. However, they can be extremely territorial and will bark at strangers. The breed has a waterproof coat that does not require clipping, with a well-developed undercoat. And weighs about 30 to 40 pounds. Their coat is usually white with chestnut and ears tipped in the color black. They have funny long, hanging ears. The longer the ears are the more desirable for the breeding process. The dog has a waterproof coat that is long and wavy and it will shed in the Summer, so you will have no need to cut their hair. Kooikerhondjes do shed hair. First shedding starts when puppy fur starts to be replaced with adult fur between 12 to 16 weeks of age. Regular brushing is all that is needed to maintain the coat. They also have great appetites and will put on weight quickly. If the dog goes into competition the main things that will disqualify the Kooikerhondje, is the tricolored coat, missing white blaze mark on the head and white on the ears. In order to take care of this dogs coat you will need to be sure that you give the dog on the regular basis and make sure your dogs ear very clean. The Kooikerhondje need lots of exercise. They also love to swim run and fetch. The Kooiker Hound is happiest when the are playing games which involve fetching balls and sticks and chasing. The ideal place for exercise would be the park or a large backyard, they are fast and graceful. They also have an infinity for the water so a small pond would be a great place for them to swim. The Kooikerhondje's affectionate and sturdy nature makes it an excellent choice as a family dog. They tend to be good natured, happy and very self- assured. However, it has been noted that Kooikers are sometimes cautious with strangers and other dogs. Although apartment living is not ideal, they can fit in to a smaller living space, but they do better with more room and a fenced in yard. You will also find that this dog is extremely obedient. You will love how quiet these dogs are, and seldom ill. Though they are quite friendly, they may not be amused with busy, loud children. Obedience training is a must for the Kooikerhondje. Kooikerhondjes have lots of energy and love to run outside and are very keen to check out everything. They have extremely curious and active minds. If they see, smell or locate something fascinating, they will often zero in on it and ignore everything else, including their owners. Obedience training will help curb their single mindedness and teach them better control. You should also be aware that when training the Kooikerhondje breed, it is best to teach them discipline and use rewards to get them to do what you ask of them. Be stern but don't yell at them, this could have an adverse effect on their training. They tend to be unhappy with people they don't know touching them. This dog is extremely sensitive and if you teach them by just the difference of your tone when talking to them you will be able to effectively teach them how to do what you say. The Kooikerhondje is an ideal choice as a family pet. The Kooiker does require attention and they love to interact. Long walks and intelligent games will keep them happy. They do not like to be bored and will quickly invent games if left alone for too long! They are great hunters and working dogs with the ability to adapt to any situation with the right training.